Stir 5 drops red food color and 5 drops yellow food color into vanilla frosting to make orange frosting; set aside. On large serving tray or cookie sheet covered with foil, arrange 24 cupcakes as shown in diagram. Frost center body of butterfly and antennae with chocolate frosting. (Push cupcakes together slightly to frost entire body and antennae, not just individual cupcakes.) Frost remaining cupcakes with orange frosting for wings. (Push cupcakes together slightly to frost entire wings, not just individual cupcakes.) Pipe chocolate frosting outline on wings, if desired. 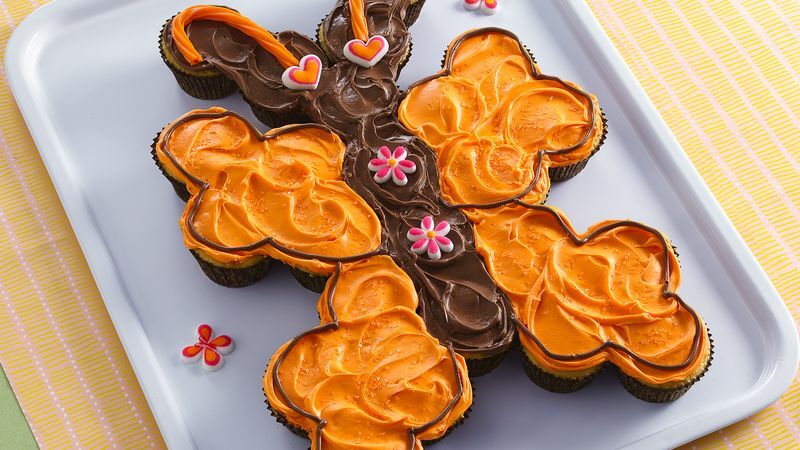 Decorate butterfly with candies and sugar. Store loosely covered. To order the decorations shown, go to fancyflours.com and search for royal icing sugar decorations. For more vivid color, use paste icing color. Let kids get creative and have fun decorating the butterfly wings. They can even pick out their favorite candies to use.